Kate Hudson and her boyfriend Danny Fujikawa will become parents very soon! The actress is in her late pregnancy months and she seems to enjoy the process. With the support of such amazing mate like Fujikawa, we are certain that the delivery will run on wheels. Kate is a known yoga-lover and she incorporates her favorite practice into the daily routine. After all, the correct breathing is important when you are giving birth to another human being. Recently, the Almost Famous star took to Instagram to share a photo of Danny and herself doing some yoga stretches together. 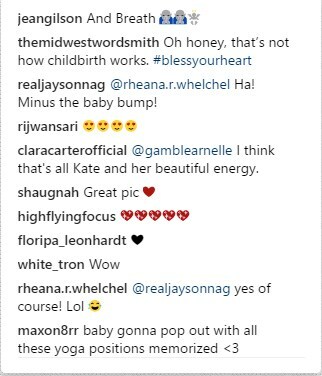 Hudson shared a new snap on her social media as she showed off her protruding baby bump while doing some stretching movements with Danny. 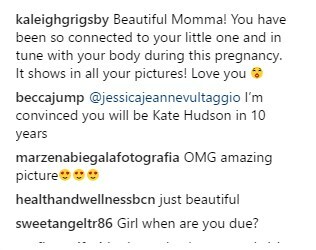 READ ALSO: Kate Hudson Posts A Three-Generation Photo On Social Media. Just Look At Her Baby Bump! The 39-year-old looks completely relaxed as she leans on her assistant arching her back and entering the ‘zen zone'. Perhaps, the Goldie Hawn’s daughter needed a little bit of a tension relief due to little stress that can walk in hand with the later months of pregnancy. On the snap, Kate looks all sporty and fabulous in a black sports bra and matching leggings that are likely to be a part of her own line of the activewear company she co-founded in 2013.